Dealing with full or partial hearing loss can be a stressful and overwhelming process for both children and parents. Most cases of pediatric hearing loss occur in families where the parents do not suffer from hearing impairment, which can make the process more difficult to navigate. Although many auditory problems are diagnosed at birth, the signs of loss of hearing can manifest at any time from child to child, and understanding the symptoms and getting an accurate diagnosis as soon as possible is the key to child hearing loss treatment. The human ear is an intricate and complex system that helps the brain to both process sounds and maintains our sense of balance and spatial orientation in relation to the objects and the world around us. In childhood, hearing plays a critical role in learning and development. Hearing problems can interfere with a child’s intellectual, social and emotional development, which can be especially frustrating and stressful for children who are too young to adequately express and communicate their symptoms. The ear is divided into three parts: the inner ear, the middle ear and the outer ear. Sound enters through the outer ear and passes through the external auditory canal to the eardrum (tympanic membrane). When sound reaches the eardrum, it causes vibrations which pass through the cochlea in the inner ear. The cochlea transforms the vibrations it receives from the eardrum into the nerve signals that are sent to the brain to interpret sound. Congenital (present from birth) defects and injuries in the inner ear can impair a child’s hearing and development. Many children are born with hearing defects. Other cases are the result of injuries, inflammation, and infections in the middle or inner ear. What is the Difference Between Cochlear Implants and Hearing Aids? Child cochlear implants are an alternative to hearing aids for children with advanced hearing impairment or complete child hearing loss. The hearing loss treatment works as a replacement for a damaged cochlea. The FDA (Food and Drug Administration) has approved the use of implants on children over the age of one. While standard hearing aids amplify sounds by making them louder, a child cochlear implant produces electrical signals that stimulate the auditory nerves to recreate sound for children suffering from near or total deafness. Is Your Child a Good Candidate for a Cochlear Implant? Parents should seek treatment for their child as soon as signs of auditory problems become evident. The otolaryngologists at Pediatric ENT Associates in Birmingham recommend getting the implant as soon as possible after the onset of child hearing loss, especially for children in the speech and language acquisition phase of development. Studies have shown significant improvements in speech, learning and hearing in children who receive a cochlear implant by the age of 18 months. However, children who lose hearing after they have started to speak can also benefit from the cochlear implant. Find out more about child hearing loss at WebMD. 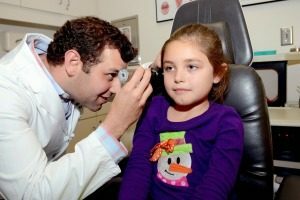 If your child is suffering from congenital loss of hearing or exhibiting newly developed signs of difficulty hearing in one or both ears, contact Pediatric ENT Associates by calling (205) 831-0101 to learn more about child hearing loss treatments and to schedule an appointment with an ear, nose, and throat doctor today. Next, read Is a Cochlear Implant Right for My Child?